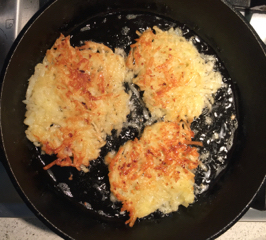 There is nothing more guaranteed to remind me that I was a German kid than potato pancakes. In Germany, they are incredibly popular. Here, they were something we had as children, and then stopped making for some reason. Maybe it seemed like childish food and we’d grown up. For whatever reason, when I rediscovered them recently, I was instantly taken back. And I instantly remembered why I loved them so much. My god, they’re delicious. I’ve been making quite a bit of German food lately – some favourites, some newcomers, some reminders of much-loved food from the past – and these were the ones that topped the list, as far as Dave was concerned. He was shocked (and a bit baffled) that I’d never made them for him before. 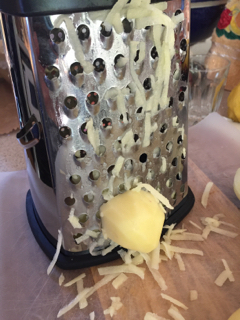 When you squeeze out the grated potatoes, it produces quite a lot of excess liquid. 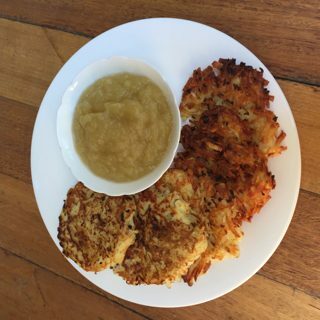 Here, I pair them as I always had them, with apple sauce. But you can serve them with just about anything, and they go especially well with that other German favourite, sausages. I call them Reibekuchen, but they have different names depending on where you are at the time – Kartoffelpuffer, Kartoffelpfannkuchen, Reibeplätzchen or Latkes. What I have here is a fairly small serve, suitable for 2-3 people, 4 at a pinch. If you’re feeding a tribe, just double the mix. Don’t be surprised by how many people can put away. Fry til brown on each side. These needed longer, but you can flip them again if they aren’t brown and crispy enough. 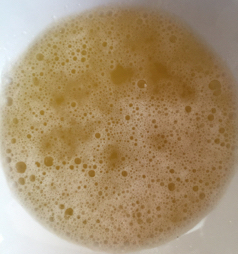 Put everything in a saucepan and cook gently until the apple is soft. Make sure it doesn’t burn. Remove cinnamon stick. Verdict: Do not underestimate how delicious these are, or how much people like them.